The user uploads the DIP to the access system, or stores it for future use. When the DIP is prepared, Archivematica moves the DIP into the uploadDIP directory, which triggers the dashboard to display the DIP upload options to the operator. After a DIP is uploaded/stored, it is moved to the uploadedDIPs directory, which can be emptied in the Administration tab- see Processing storage usage. The user must create the description in AtoM (or other access system) before uploading the DIP. The user will need to indicate part of the description’s URL or a target collection in order to send the DIP to the appropriate place in the description. If you have chosen to generate a DIP (dissemination information package) at the Normalize micro-service, you can upload it to one of several content management tools (listed below). The DIP includes the access copies made through either Archivematica’s normalization rules or a manual normalization process, as well as thumbnails, and a DIP METS file. 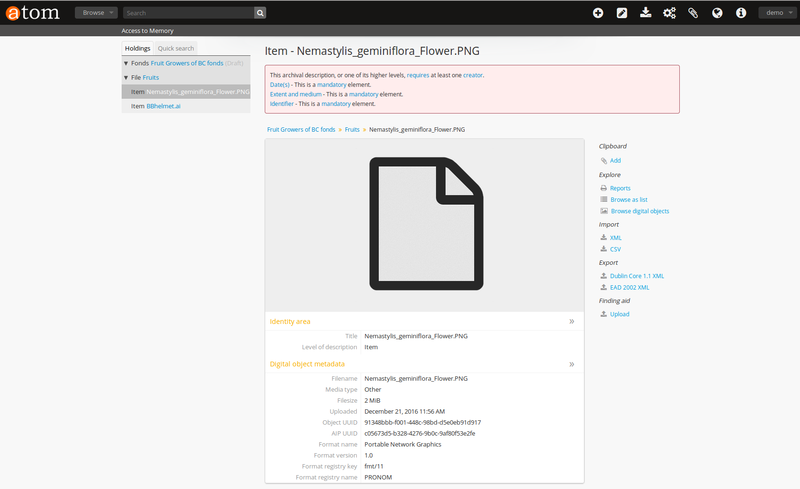 A content management tool called AtoM is Archivematica’s default access system. AtoM supports standards-compliant hierarchical archival description and digital object management. AtoM stands for Access to Memory. It is a web-based, open source application for standards-based archival description and access in a multilingual, multi- repository environment. User and Administrator manuals for AtoM are available here . To upload DIPs to your AtoM instance, you must enter your AtoM information and credentials in the Administration tab. See Administrator manual - AtoM DIP upload for more information. In the ingest tab, select “Upload DIP to AtoM” in the Upload DIP Actions drop-down menu. A dialogue box will appear. Enter the permalink of the description in the dialogue box. The permalink is the “slug” from the AtoM target description. See slug in the AtoM glossary. Click the blue “Upload” button. Digital objects are uploaded as items within the description to which the DIP is being uploaded. If you want to create a child level of description under the target description, you must add the title of that level of description using the DC metadata template prior to normalization. If you add metadata to the DIP during Ingest, a file-level record will be created in AtoM below the chosen parent record. The metadata will be written to this file-level record and the digital objects will be added as child items. If you do not add metadata, the digital objects will be added to the parent record directly. When the DIP has finished uploading, open the Access tab in the dashboard. This tab shows the AIP and its uploaded DIP. If you are not already logged in to AtoM you will need to log in using your login credentials. You will see an archival description with the metadata you added during ingest, displayed in the context of the level of archival description to which the DIP was uploaded. To view an individual digital object, scroll through the thumbnails click on an image. The digital object is displayed in AtoM. Clicking on the image will open the uploaded object. In Archivematica 1.6 and higher, you can send AIP object metadata to AtoM without uploading dissemination copies of the files. This may be a helpful workflow if you have digital objects which you wish to make discoverable, but not displayed online for copyright or privacy reasons. SIPs with levels of description assigned using the arranging for AtoM workflow- the levels of description will be ignored in this workflow. Create a SIP using the Transfer process as normal. During Normalization, choose one of the options that normalizes the package for access. During the Upload DIP micro-service, select Upload DIP to Archives Space. The Match page should automatically open. Create a SIP using the Transfer process as normal. During Normalization, choose one of the options that normalizes the package for access. 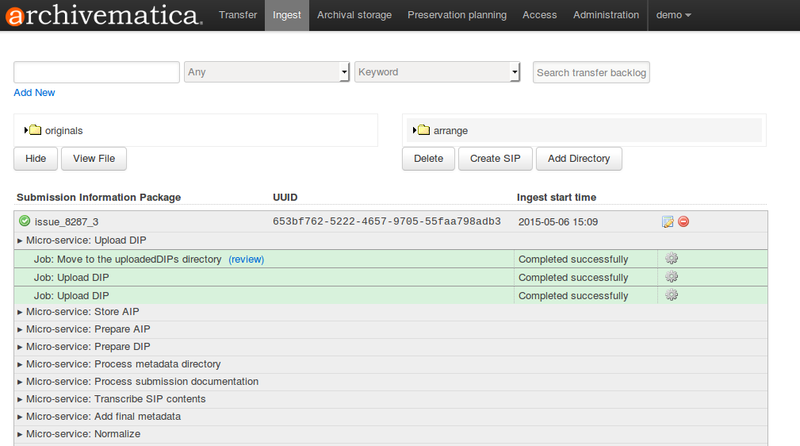 During the Upload DIP micro-service, select Upload DIP to Archivists’ Toolkit. The Match page should automatically open. By clicking the Access tab in the Dashboard, you can see a table showing all DIPs upload to AtoM including the URL, the associated AIP, the upload date and status, and the option to delete from the Access tab. Note that this link will delete the record of the DIP in the Access tab, not the actual DIP.